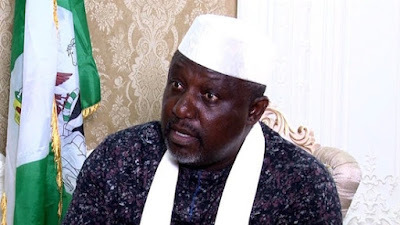 Governor Rochas Okorocha of Imo state has asked the federal government to declare Nigeria as a nation at war following the recent killings of some soldiers by Boko Haram insurgents in the northeast. Thursday, November, 29, when officers from the Armed Forces Command and Staff College (AFCSC) Jaji, paid him a courtesy visit at the government house, Owerri. “A nation has to be in a serious war to lose 10 soldiers, not to talk about 40 soldiers. So Nigeria must declare itself as a nation at war,” the governor said. He compared the security situation in the northeast to what was happening in Imo state when he first resumed as governor. “What I think is happening in the North-East is what was happening here in Imo State when I came in 2011. Owerri was notorious for kidnapping and we were number one State for kidnapping when I came in to the extent that by 5.30 or 6pm everybody had gone home for fear of being kidnapped. But we tackled it and overcame,” Okorocha said.